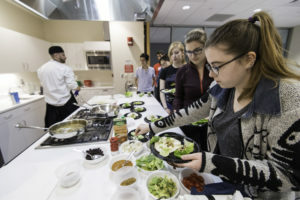 But according to the 2017 National College Health Assessment, University of Rochester students are falling short of the national dietary recommendations. For example, only 5% of students are consuming the suggested five servings of fruits and vegetables per day. In fact, most students (about 59%) are eating only one or two servings each day. While healthy, local food choices are readily available across campus, we realize your demanding schedule might take precedence over making time for a healthy meal. That’s why our nutrition programs are created for the busy Rochester student. We provide practical tips and real-life strategies for eating healthy every day. Our line-up of EAT Healthy programs teach students that healthy food can be Easy, Affordable, and Tasty. Check out our online program, cooking demonstration, and market tours below. Challenge yourself each day to implement a new strategy to help you pay attention to what you you eat and how you eat it. 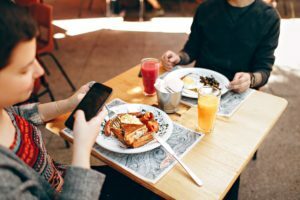 That could mean turning off the technology while you enjoy lunch, becoming more aware of when you’re hungry (and when you’re not), or feeling motivated to choose foods that are both satisfying and nourishing . This program is customized to YOU, so that you can make the changes you need to EAT Mindfully. Do you live in a residence hall or apartment with a kitchen, but have no idea how to prepare a healthy meal? Check out our cooking demonstrations! Offered throughout each semester in the Community Kitchen in Douglass Commons, you’ll get hands-on experience making simple and delicious meals. Interested in scheduling an EAT Healthy in the Kitchen program? Complete our program request form. Note: A small fee may apply for this program.